In 1973 a 19 year old kid named Bruce Edwards got an incredibly lucky break when he picked up the bag of the soon to be great Tom Watson. That year marked the beginning of a wonderful partnership that spanned 30 years and yielded multiple major championship victories. 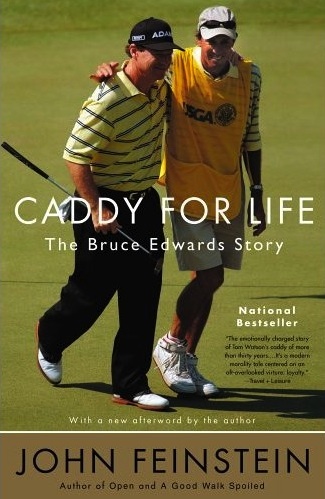 This biography chronicles one of the greatest caddy careers there has ever been from its inception to its sudden and tragic end in 2004 when Bruce lost his fight with Lou Gehrig’s disease. Told from inside the ropes, this tale of friendship, perseverance, success, and devastating loss will have you laughing, cheering and shedding tears. Golf may be the context for this story, but anyone who has ever had a best friend or brother can identify with this book. One word of advice . . . do not read this book on a plane unless you are man enough to cry in public. Highly recommended for anyone with a pulse. In a side note to the Bruce Edwards story, back in 1974 one of the members of the golf team at the prep school I attended here in Connecticut was Greg Rita, who grew up playing golf in the Wethersfield, Ct area and knew Bruce Edwards. Greg went on to caddie for Dale Douglas I believe between his junior and senior years in high school, perhaps through his contacts with Bruce, and then went on to caddie full time on the PGA tour for a numbers of years, first will Gil Morgan and eventually with Curtis Strange when Curtis won his two U.S. Opens and also for John Daly when John won the British Open at St. Andrews, among others. Sadly Greg passed away on his 54th birthday I believe after a long fight with cancer. Today on the PGA tour, Joe LaCava on Tiger’s bag carries on the tradition of prominent PGA caddies from central Connecticut. I read this on vacation this year. My wife rolled her eyes when she saw the tears. “How can you cry at a book about golf?” I agree this is not a book about golf. So many life lessons.